The crowning attraction of Lachung is the beautiful Monastery, which is locally called Lachung Gompa. It is an age-old monastery, erected in the year 1880. Set amidst beautiful apple orchards, the monastery truly offers a visual pleasure. The monastery also houses a number of murals, and it also flaunts two wheels. Many tourists also visit the handicraft center, where exquisite blankets and rugs are woven beautifully. You will fall under the spell of the picturesque Yumthang Valley, nestled at an altitude of about 11800 feet. This place is also renowned for the Shingba Rhododendron Sanctuary, through which flows the winding Yumthang Chu. The sanctuary nurtures more than 24 species of Rhododendron trees, the State Flower. Mount Katao is a beautiful destination near Lachung that is located at a distance of 30 km. However, this tourist site only welcomes visitors from India. Lachung is located at a distance of 100 kms from Gangtok. So, trips are also made from Lachung to Gangtok, which takes around 5 – 6 hours and this journey is truly fascinating. Take a stroll along this beautiful village and savor its scenic natural beauty. Skiing is also conducted in Phuni near this town. Lachung is also the base camp for Rhododendron valley trek, which embarks from Yumthang Valley and ends at Lachen Valley. However, Lachung sightseeing while enjoying nature and the Himalayan Mountains is the best thing you can do at Lachung. Lachung can be reached by availing buses and cabs from locations within the state of Sikkim. The nearest railhead of Lachung is the New Jalpaiguri Rail station in West Bengal, located 139 km away from Lachung. The nearest airport of Lachung is the Bagdogra Airport in West Bengal, connected to different cities of the country. However, visit to Lachung is done in Package Tours from Gangtok as special permits are required to visit Lachung village. The summer months extending from March to June are the ideal time to visit Lachung. The climate during this time remains mild and pleasant. However, if you are visiting Lachung in winter, carry adequate warm clothes, as winter temperature dips down as low as –5 degree Celsius. Lachung hosts a good variety of budget hotels and resorts, offering decent lodging and dining facilities. 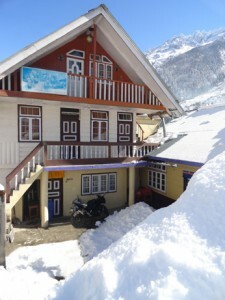 Lachung hotels have comfortable rooms with attached bathrooms, hot water geysers, room heaters. Budget family rooms and deluxe category rooms are available at Lachung for comfortable stay. Hotels have restaurants and server mainly local Indian cuisine. However, to easily visit Lachung it is best to opt for Lachung Lachen package tour that are operated from Gangtok.